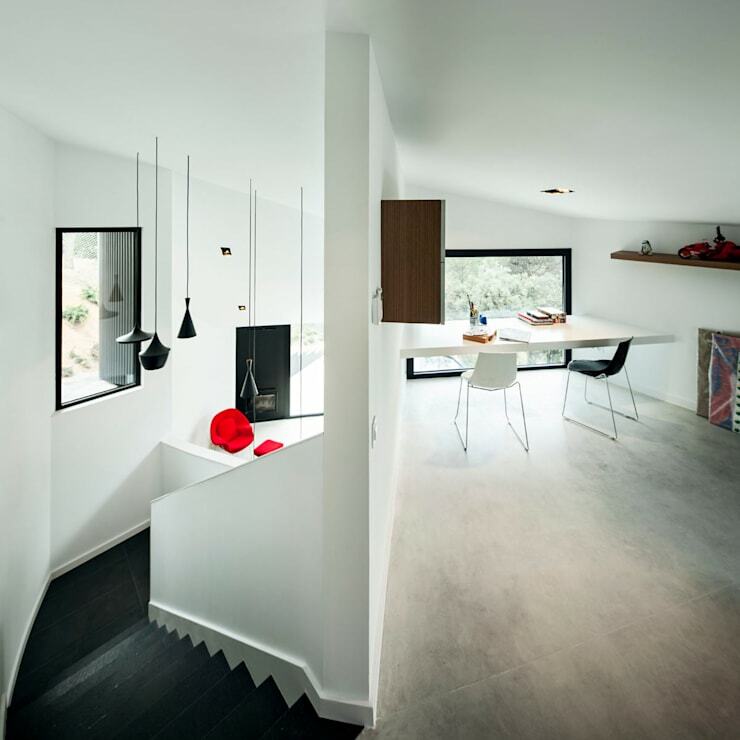 Located in the Spanish village of L’Ametlla del Vallès in Barcelona, this house was creatively rendered by the architects at Mirag Arquitectura I Gestio. 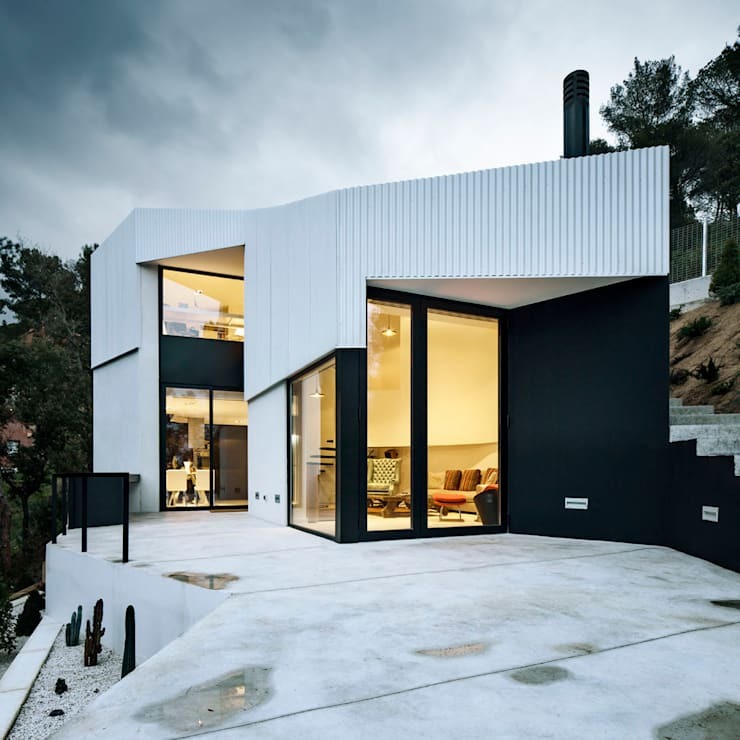 With a verdant pine forest to the west and some private residences to the east, this uniquely designed abode combines black and white to make a stunning statement unlike anything you have seen before. Its street-facing façade is dark, opaque and unusual, while the backside opens up to the beautiful garden and forested landscape. Built on a sloping plot of land, the parking area of the house is on a higher level or at the street level, while the other living spaces are at a lower level to ensure privacy from the street traffic and noises. The studio or the study room is at the street level though, and acts as a middleman between the front and back facades. 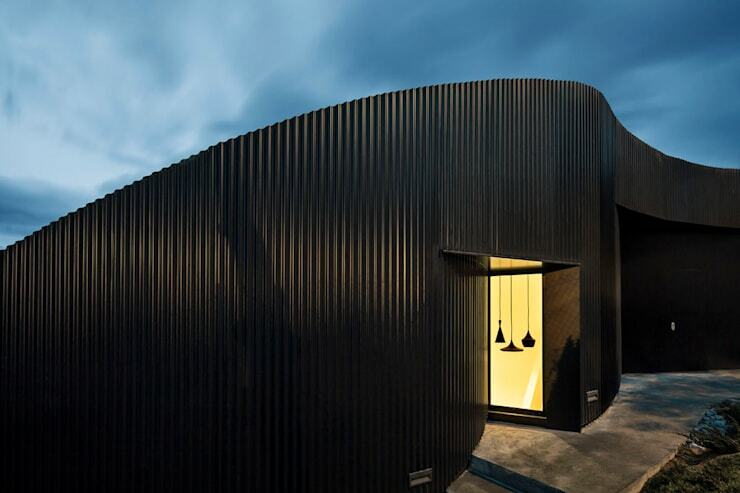 The wavy and dark appearance of the front facade is not just unique, but it also mimics the undulations of the picturesque landscape surrounding the property. It gives no clue about the bright, open and completely opposite back facade. Note how elegant and private the front facade appears with its textured surface and curves. It perfectly protects the owner’s privacy, while a single door leads to the studio at the street level and is the inconspicuous entry point. As you can see here, the staircase is a very fashionable one, with sleek floating steps standing out against the white wall. The open kitchen with its combination of black, white and dark grey is minimal, practical and full of personality. This cosy and vibrant spot enjoys the benefits of a double-height ceiling, thanks to the studio above. The luxurious armchair and faux fur rug promise tons of comfort, while glass windows near the ceiling bring in generous amounts of natural light. Lavish use of white and a unique ceiling make the studio a spacious, bright and airy space. Trendy and minimal furniture add to the style quotient, while a sophisticated staircase takes you to the other living spaces in the home. 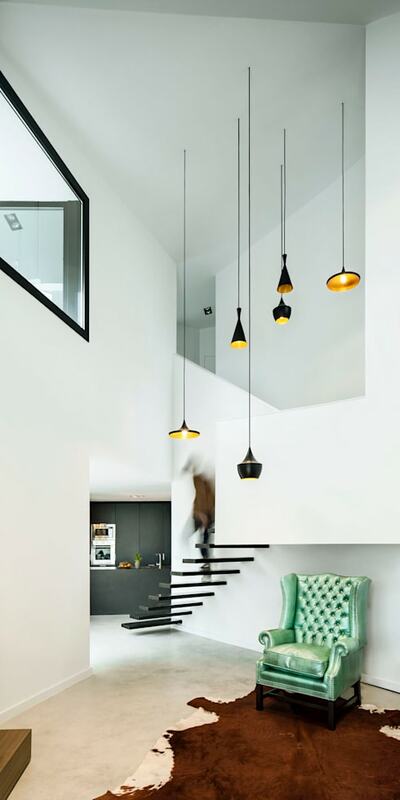 Black lamps hang from the ceiling stylishly, while glass windows keep all areas well-lighted. Equipped with a long array of windows, sleek glass panels, and a massive mirror, the large bathroom looks bright, breathable and open. Gorgeous turquoise tiles add pizzazz to the wall behind the stylish tub, while dark grey tiles celebrate the monochrome color palette of the house. Since the backside of the house turns its back to the street-side traffic and bustle, it opens up quietly to nature through lavish glass doors and windows. Quirky lines and angles add unique charm to the building on this side, while white dominates the scene to indicate openness. The garden is a landscaped affair and looks pretty with its pebbled beds.